a yearly event presented by the University High School Instrumental Music Program since 1990. The Craft Fair was created to help offset the rising costs that the school's music program accrues from competitions, instrument repairs and uniform cleanings. This is the largest fundraiser that the band booster club, IMPA (Instrumental Music Parents Association), organizes to raise money for the music program and we would like to welcome and thank you for participation in supporting these fine talented musicians. Our goal is to make this the most successful event your both YOU and US! Our event consists of 85% hand crafted items and 15% commercial. On average we welcome about 2,500 customers and with new advertising concepts this year, we are expecting much more!! 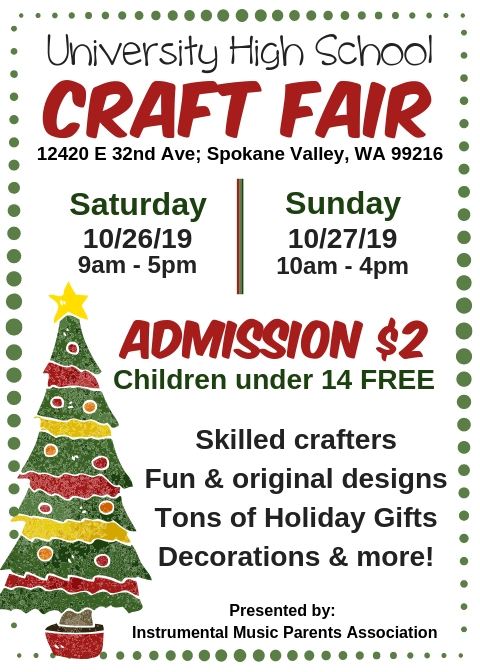 This year's dates for the Fall Craft Fair are October 26th and 27th, 2019. If you have any questions please contact us, we look forward to meeting you!